How much did your engagement ring cost? It may be a sign of how long your union will last. Several months before we were engaged, my fiancé Patrick inquired about what sort of rings I liked. I knew why he was asking, so I cut to the chase and sent him a detailed and terribly unromantic email describing my dream engagement ring to a tee (along with links to sites), and then put in bold font: Do not spend a lot; if you do I will say no. I was joking of course, but not about my desire for him to stick to a sensible budget, since we were living more or less paycheck-to-paycheck at the time. Patrick did end up spending a tad more than I would have liked, but it wasn’t outrageous and the ring is just what I would have picked for myself (probably because it came from one of the links I sent him). Three years later, as we’re finally about to walk down the aisle, I stumbled across research that has me wondering whether being financially shrewd about the engagement ring (and now about our wedding) won’t only help our bank accounts, but also help our marriage’s odds of lasting. The research, co-authored by Andrew Francis-Tan, a visiting associate professor at the Lee Kuan Yew School of Public Policy at the National University of Singapore and Hugo M. Mialon, associate professor and director of undergraduate studies in the department of economics at Emory University, examined the association between wedding spending and marriage duration using data from their survey of over 3,000 ever-married adults in the U.S. 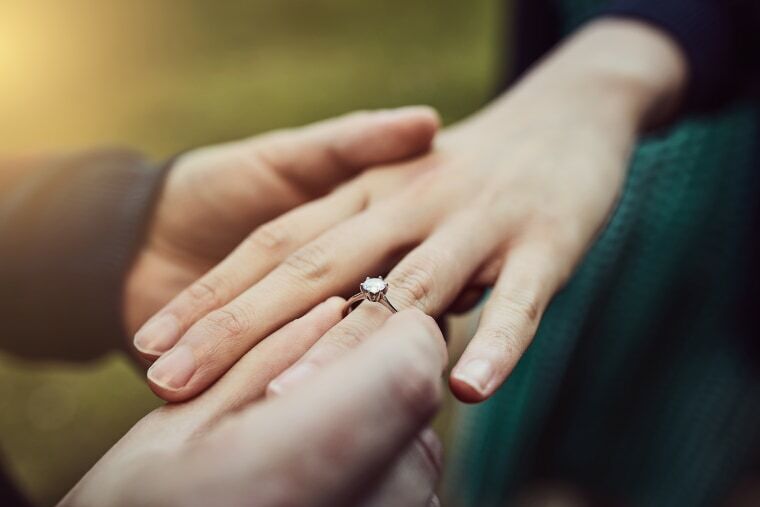 The motivation of the research was to uncover whether spending a fortune on a ring and a wedding, (as we’re frequently inclined to do, often to our own regret) impacts the longevity of a marriage. In their research, Francis-Tan and Mialon found that men who spent between $2,000 and $4,000 on an engagement ring had a higher rate of divorce (of about 1.3 times) than men who spent between $500 and $2,000. Men who spent between $2,000 and $4,000 on an engagement ring had a higher rate of divorce than men who spent between $500 and $2,000. What this research lays a case for is that splurging on “forever” diamonds and extravagant weddings won’t improve your chances of staying together, and could, in some ways, hurt them. Why? Possibly because you’re focusing less on forming an enduring union than you are on celebrating the beginning of one, and maybe even digging a debt hole in the process. Not only might the impact of big spending strain a marriage, it creates opportunity for arguments. A statement engagement ring was never something I’d yearned for, but I did find myself upping the filters on Instagram to make my ring look sparklier when first sharing it on social media. When showing off the ring in person, I went on out-of-character rants about how much I loved simple, vintage-inspired styles and how much I disliked gaudy baubles. It was almost like I was defending my ring from those who may silently judge it as “not enough.” I couldn’t understand why I was behaving this way when I knew the ring was exactly what I wanted, and that it had been far from cheap. What was my problem? Well, it probably had little to do with the ring. Had I been presented a more decadent ring, immediately followed by a luxurious whirlwind wedding (rather than waiting, as we did, to plan a smaller affair), perhaps I would have been more distracted from what I really needed to be focusing on: enforcing a strong and healthy partnership. “Lavish spending and focus on materialism may be a distraction from other issues in the relationship, and the planning of a wedding/engagement takes up a lot of time and energy invested towards the event which may be a welcome distraction for couples who do not have a solid foundation or have serious concerns about the relationship to begin with,” says Christie Tcharkhoutian, a licensed marriage and family therapist.